So far, you have read and heard a lot about the importance of securing health insurance for yourself and your family. Shocking stats about increasing lifestyle diseases and rising medical costs are available aplenty on internet as well. And, there is no dearth of quality health insurance covers in India too. So, what's stopping you from bagging the best health insurance in India? Perhaps, the abundance of health policies coupled with an array of features associated with them have made you a bit reluctant and wary of making the effort. For a novice, it is well and truly an arduous task to go through the features, benefits and limitations of each and every health plan and trace out the best health insurance in India, especially when you are not well aware of which features are to be considered as benchmarks and which ones don't deserve prime focus. What if you get to compare health insurance at ease and that too during your weekend while sitting in your cozy couch and watching a cricket match on TV? Sounds too nice to be true? Wait a second. At GIBL.IN, the premiere online insurance marketplace India it is very much possible. Your lack of knowledge about a myriad of health insurance products will not be a bar as this bespoke online insurance comparison portal not only let you compare health insurance for free but also educate not so well-informed consumers like you about every feature by providing every minute detail. All you need to do from your end is divulge your personal details and choose the coverage you want. You can compare individual health policies if you want to cover yourself only or if you are looking for a health cover for your entire family you can also weigh up family medical insurance policies. In case you have elderly parents at home you can also evaluate health plans that are exclusively designed for senior citizens. Let's embark on the journey to find the best individual health insurance policies in India and see how GIBL.IN fares to facilitate you with a fast and painless comparison which leads to the selection of the best health insurance plan in India for an individual. Almost all health insurance providers in India offer a set of health plans meant for individuals. 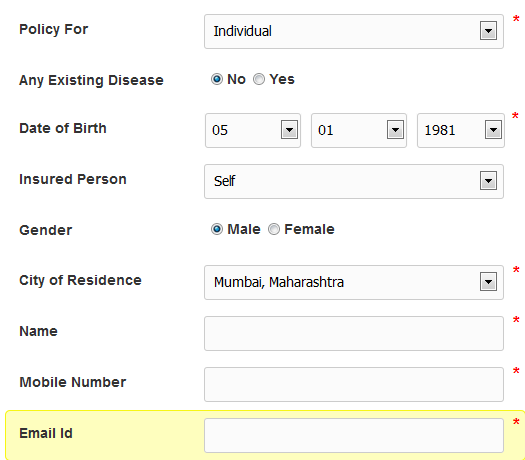 So, when you visit the health insurance section at GIBL.IN, you need to divulge your personal details such as your name, gender, city of residence and the likes to get a list of health insurance quotes available for you. Once you get a list of health quotes, you have to begin the process to compare health insurance by determining the coverage. Even though you are hale and hearty and brimming with confidence about your own wellness, you need to choose a higher amount keeping the increasing rate of medical expenses into account. A coverage of Rs. 10 lakh will suffice your needs health insurance supposing you are 35 years old male person and living in any of the metro cities like Mumbai. At GIBL.IN, you have the freedom to choose from a wide range of sum insured amount between Rs. 1 Lakh to above 25 Lakh. 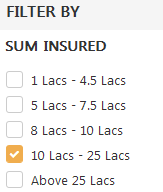 By choosing a sum insured of Rs. 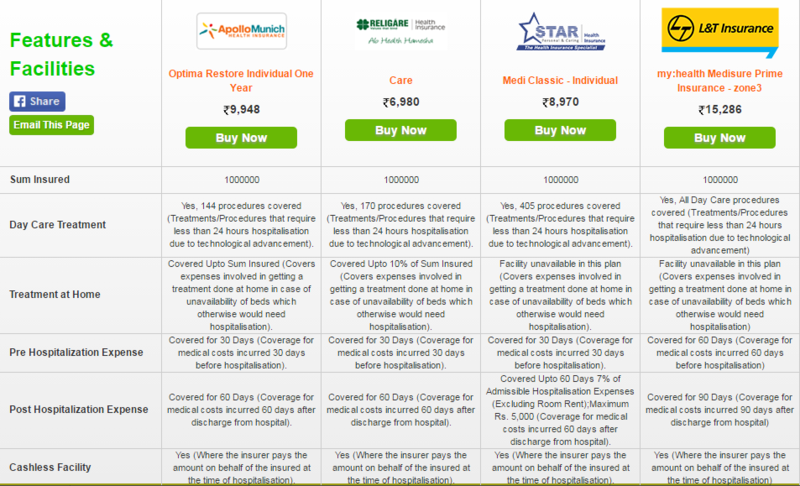 10 Lakh you will get to compare more than 20 health covers at GIBL.IN. All health insurers in India are not equal in terms of the time they take to cover pre-existing conditions. While some insurers are bent on imposing a rigid 4 years waiting period some are quite lenient and they cover such conditions after 2-3 years. Since, your best bet would those policies that provide coverage after 2 years you can select that waiting period at GIBL.IN as well. This option offered by health insurers in India help policyholders pay less premium. Co-pay clause refers to a pre-specified amount chosen by insured to pay at the time of the claim. Typically, there is 10%-25% co-pay option available with most health insurance plans. If you go for 10% co-pay, you will have to pay 10% of the entire claim amount and your insurer will take care of the rest of 90% of the claim. At GIBL.IN, you can choose to go for co-pay option or if you don't want to contribute at the time of claim you can decide against it. This is a vital feature as if you don't pay heed to this facet, it can make even your Rs. 10 Lakh coverage inadequate. Many health insurance plans come with a cap on maximum coverage for room rent. In most cases, the capping is set at 1% or 2% of sum insured. In case, you need to undergo a serious treatment you would invariably want to get admitted in high-end private rooms with advanced treatment facilities. But if the limit on room rent restricts you from getting admitted in your preferred room your whole purpose of availing a health plan with RS. 10 Lakh would be defeated. Hence, you should look for the best health insurance plans that don't come with any limit on hospital room rent. GIBL.IN facilitates you with the scope to compare health insurance policies that don't come with caps on room rent. Gone are the days when health insurance plans were issued for only one year. Now many insurers have come up with insurance plans with 2 years tenure that you can avail. These Health covers are also cost-effective as the you have to pay less for premium of plans with 2 years. Once you have managed the downsides of health insurance plans in India well you should make the most of the facilities on offer to customize the plan according to your requirement as well. If you need additional protection against critical illness or if you have a family you can opt for maternity cover as well. Some of the best health insurance policies in India also offer restore benefits which mean when your basic sum insured gets exhausted due to multiple hospitalization in a single policy year, the sum insured gets automatically restored to Rs. 10 Lakh. You can also include this benefit in your health cover. At GIBL.IN, you just have to check these boxes to customize your health cover with all these benefits. Now that you have got a list of health policies as per your chosen coverage amount in no time, you need to shortlist them and compare the best health policies. 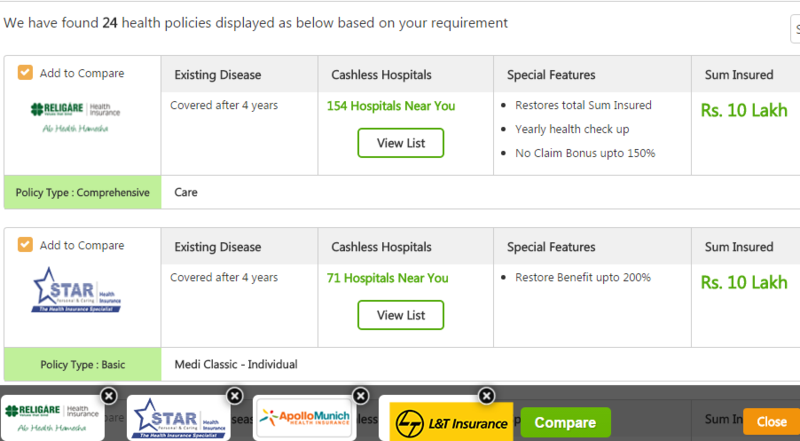 At GIBL.IN you can choose as many as 4 health plans among them to make a detailed comparison. You have to compare 4 of the best health insurance plans available for you in terms of some other important features such as coverage for day care treatments, domiciliary treatments, pre and post hospitalization expenses, ambulance costs, Ayurvedic and other unconventional treatments, donor expenses. You can also compare health insurance policies in terms of various value added services in the likes of restore benefits, no claim bonus, free health check-up, maternity benefits, Income Tax benefits, family discount, hospitalization cash and the likes. Since GIBL.IN facilitates you with all aspects of your chosen 4 best health insurance plans on one platform you can easily figure out which health policy surpasses others on the basis of beneficial aspects and is the standout among them. At the the moment, India's health insurance market is coming off age as new insurers are constantly making their appearances with innovative health insurance products. Along with health insurers, life insurance companies have also joined the bandwagon with their own set of health insurance policies. IRDA is leaving no stone unturned for deeper penetration of health insurance across India. This apex institution for insurance in India have lately come up with consumer-friendly moves such as portability of health insurance and making efforts to minimize the list of exclusion in health insurance coverage. All in all, there is no better time than now to avail a health cover and now that comparing health insurance policies has become a fast and effortless affair at GIBL.IN you have absolutely no reason to not to have recourse to the best health insurance policies in India. It is the right time to sort out your needs and compare health insurance online as per your affordability.